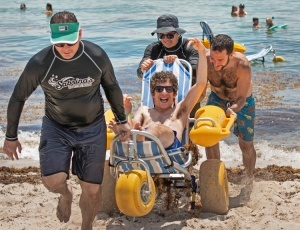 For volunteers from the Miller School of Medicine Department of Physical Therapy, Adaptive Beach Days are about fun, sun, water — and helping dreams come true. Twenty yards from the ocean. Twenty yards from the magic these waters offer. Yet an accident or debilitating illness has put in place a nearly impassable divide, one that some have waited years to cross and once again feel the joy and freedom. That wait is nearly over. Volunteers from the Miller School of Medicine Department of Physical Therapy help people with special needs enjoy the ocean from April to November. The trek begins with a smooth transfer: one physical therapist grasps one participant’s legs, a second wriggles his arms around the upper back to clasp the chest, another steadies the WaterWheel Floating Beach Wheelchair, then together — one, two, three, and careful to get just the right clearance — they make the hoist. The canary yellow wheels start to roll, and the blue-and-white-striped buggy glides down over the 70-pound rubber access mats spread on the sand, assisted by four attentive aides. The journey to joy is underway. Kayla Weber and Christopher DaSilva, both pursuing a clinical doctorate degree in physical therapy (DPT) at the University of Miami Miller School of Medicine’s Department of Physical Therapy, volunteer nearly every Sunday for these Sabrina Cohen Foundation Adaptive Beach Days. Out of their dedication, the two also coordinate the team of department volunteers whose involvement has been critical over the past years to the success of this extraordinary program. DaSilva also knows the joy of the ocean. He grew up in Southern California near the beach and has been swimming since he was five. For the past three years, from 10 a.m. to 3 p.m. on the first and third Sundays in April to November, a segment of Miami Beach at 64th Street becomes the launching point for a gathering of people with special needs, Sabrina Cohen Foundation staff, and a dedicated mix of exuberant volunteers. Some participants come just to sit by the water under the shade of a big blue tent, but most wait their chance to be in the water. They sign up online in advance for slots. Onsite, the flow is well organized: each participant is allotted 45 minutes, with some 25 minutes in the water. At least three and generally four therapists accompany each participant at every step of the way and in the water. Between 25 and 40 participants are accommodated each Sunday, depending on the availability of physical therapists. “Our partnership with UM has been huge, because the more student physical therapists we have the easier the flow goes,” explained Sabina Cohen, who has been in a wheelchair since she suffered an accident at age 14. A whirl of energy on this Sunday morning, Cohen spins her wheelchair to meet and greet, to kiss and hug. She appears to be an ocean of strength, and she needed every bit of her fortitude and courage to win approval for the project that many residents in the high-rises behind her resisted. She established the foundation in 2006 and first approached the City of Miami Beach with the idea for Adaptive Beach Days in 2013. Three years later, the program finally launched, and UM physical therapist volunteers have been a key component ever since. While she celebrates the volunteers whenever they show up, Cohen would love to forge an official partnership with UM to assure a steady and predictable number on any given Sunday. Jasper Nelissen, an adjunct faculty member with the University of Miami School of Communication, serves on the Sabrina Cohen Foundation board. The foundation, he explained, has shifted its original focus from seeking a cure for paralysis to “putting lives back in motion” — to allow for people with disabilities, or wounded warriors, veterans, and others to regain their day-to-day lives. “Adaptive Beach Days are very volunteer-based, and so a wonderful opportunity for students from UM and other schools, and certainly for physical therapists, to see a unique learning environment and to be part of that,” he said. Rosa Llaguno, B.A. ’85, a native of Miami who has been going to the beach “since I was in diapers” is now in a wheelchair. It had been years since she had been to the beach. Carla Ruhl has been Sabrina’s therapist for the 25 years since her accident. She’s senior physical therapist at Miami Physical Therapy Associates, and many of the UM volunteers complete their clinical work at her office. Known as “senior everything” on Adaptive Beach Days, she explains to the volunteers that their first step is to ask participants what help they need. “It’s a sign of respect,” she said, adding that safety and paying attention are critical. Lei Zhang, in the second year of the DPT program, rarely misses a Sunday.